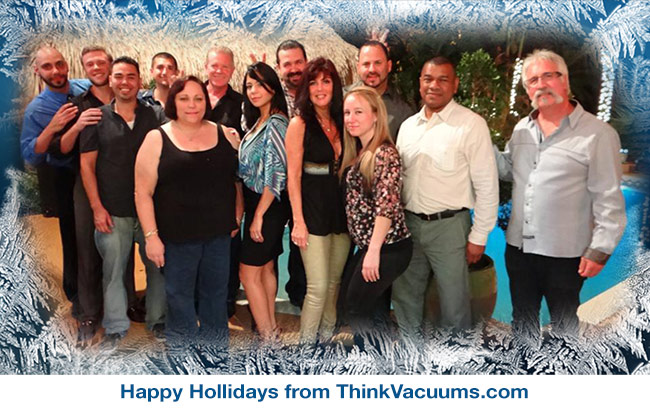 Happy Holidays from the staff at Thinkvacuums.com! We here at Thinkvacuums.com have been blessed to have so many customers this past year and we look forward to providing the lowest prices and best quality customer service this New Year! With the ever growing business and expansion of Thinkvacuums.com, we have been able to bring on more staff to make sure our customers receive even better customer service and faster shipments. We would like to welcome to our staff Brian, Madeleine, Pablo and Vince and we thank them for all their hard work. We also were greeted by Roger Boucher the International Sales Manager for Drainvac International this holiday season. It was an honor to spend time with close friends and colleagues at our company Christmas party this year and our entire staff wants to wish all of our customers a wonderful Holiday and a Happy New Year! As a Thank You to our customers mention this blog and receive $15.00 off any order of $25.00 or more. Offer expires on 12/28/12 so act fast! Suction of Killer Whale unit – extremely strong. Our home is about 4,000 square feet in size. Our 20-year-old central vac burned out, so we bought the PurVac Killer Whale because we had an available 220v outlet right near the 110v that the old unit had been plugged into, and we wanted maximum suction power. If we had it to do over again, we probably would buy the Great White instead because (and you might find this hard to believe) the Killer Whale is TOO good. Its suction power is terrific. But for that reason, it may take some getting used to if you are replacing a burned out old unit, as we were. For instance vacuuming thin metal blinds will bend the blinds, and the circumference of suction is larger, capturing small items much further from the nozzle than you may be accustomed to, such as when counters or dresser tops are dusted. Also, keeping the dusting attachment from sucking down tight against a smooth surface is difficult. The suction is a force to be reckoned with. The Killer Whale noise output at the main unit (in the garage) was actually quieter than the old unit although its suction was at least twice as good. The lower noise output at the central unit is probably due to the three mufflers that come with the unit – two on the air intakes and one large “can-type” on the exhaust. But the noise in the room where hardwood floors are swept or when dusting is extreme. Again, this is purely because of the massive suction the unit generates. Using a sweeper head that allows for greater air passage decreases the noise somewhat, but my wife still uses earplugs when she sweeps the hardwood floors. She has no problem at all with the noise output when sweeping carpeted rooms because it is greatly reduced by the carpet and pad being swept. As for sales and service support, we were pleased. The staff were very polite and helpful, and not at all pushy prior to the sale. (Shawn and Iris are two names I remember and both were very friendly.) There was a very small omission mistake in the included parts, but when I phoned, they mailed the piece immediately to rectify the oversight. Also, when we considered returning the unit to replace it with a weaker one (like the Great White), the owner advised we try buying new sweeping a dusting heads, as well as a $17.00 safety valve to decrease suction when the blinds get sucked in. He advised this to help us avoid paying shipping both ways plus a 10% restocking fee, all of which could cost us as much as $150. But further testing revealed that the valve would only kick in and work AFTER the blinds got sucked to the dusting head, and the damage would be done anyway. Also, the valve would not decrease the noise loudness on hardwoods. We decided to “get used to the noise” and mollify ourselves with the realization that the cleanliness of our carpets would be improved because of the better suction. 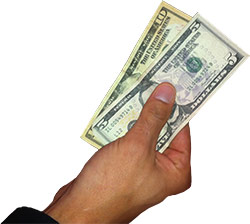 Bottom line – don’t overbuy. The Great White 110v unit will probably suffice for most large homes.